After getting his start years ago on HGTV, Orlando Soria has made his way to the upper strata of the blogosphere with Hommemaker, his blog about home decor, art, style, and life. His distinctive voice-funny, confessional, and honest-has made him the Dan Savage of millennial homemaking. Now he brings together his most original, endearing, and irreverent advice in one gorgeous book that will help readers out of all kinds of tight spots-whether it’s throwing a dinner party when you’re broke, hanging art like a gallery owner, or preparing your home for an unwanted guest. 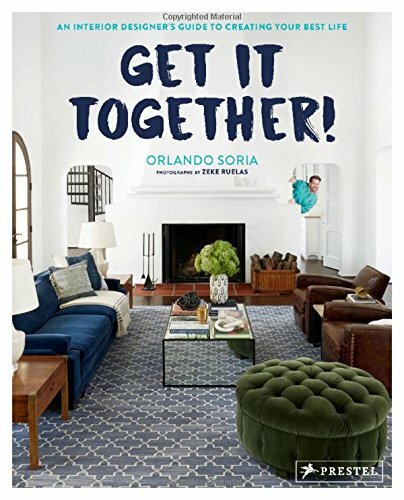 In sections on interior style, design, «Homme Life,» DIY, and general life lessons, Orlando offers advice on topics such as «How to Make Non-Garbagey Flower Arrangements» and «How to Deal with a Soul-Sucking Breakup.» He helps readers problem solve, avoid rookie mistakes, and choose a wall color that won’t make them puke. Photographer Zeke Ruelas’s stunning images accompany Orlando’s tips on designing for dudes, making your own coffee table, and decorating a kid’s room. Whether you’re short on cash or have money to burn, Orlando’s unique and highly contagious take on life will inspire, comfort, and reassure you that anyone can Get It Together!